I casually picked up a magazine while in the waiting room for my morning dental appointment. Coffee in one hand, I picked up "Seattle Metropolitan", Road Trips, a magazine with subject matter which sounded worthy of noting, and a great way to get my mind off of dental procedures in general. Quickly I turned the thick, colorful pages, afraid my name would be called before I had a chance to pause on something appealing. An article that appeared short, to the point, and within the time frame before I was to be called into the chair, caught my eye. 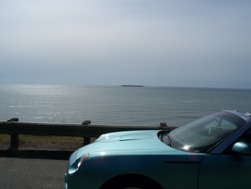 "Sequim in a Sports Car", was the title by Christopher Werners. Hmmm, I thought. I could picture myself already half there. You see, I had the sports car. It’s a dazzling retro Ford Thunderbird blue 2-seater convertible. Normally, it is a dust catcher in our garage. I had always wanted to visit Sequim, Washington State to see what the "banana belt" was all about. The dentist’s office waiting room gave me my chance. I breezed through the article before the hygienist called my name. Then, while under a gentle dose of nitrous oxide, I told myself I had to make this trip a reality. First stop getting home, I banged out "Vacation rentals in Sequim" on my PC keyboard. As a vacation rental enthusiast and owner elsewhere, I needed to experience what my own guests experience when visiting my homes. I was pleased to see a variety of vacation rentals were available in Sequim. 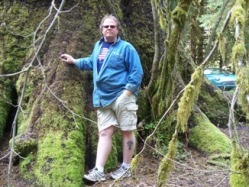 A secluded cedar log cabin called "Bayside Cedars" on Sequim Bay popped up. The price was right, and it had a hot tub overlooking the bay, which was something I knew my husband and I would enjoy. We arrived in Sequim, signed in with the friendliest property management staff, and off we drove to our personal little bungalow for the weekend. We were greeted at the door upon opening it to a waft of natural sweet cedar permeating the interior of the cabin. It had all the modern amenities of a home with one unique exception. I spotted a hand crank coffee grinder mounted on the wall! This was my cabin, indeed. Freshly ground coffee has nearly become a fetish for me. The aroma while grinding it is almost as pleasant as the drink itself. I pictured myself going back to the basics of hand grinding beans for my preferred beverage inside a cedar log cabin. I had my beans just waiting for morning, when I discovered I had actually poured the beans into a wall mounted flour sifter! Needless to say, I could not cause the flour sifter to grind my Italian Roast! My husband came to the rescue by reaching into a cupboard and locating an electric coffee grinder. We both had a chuckle, which released any city life tensions remaining in us as we moved on to more significant matters. Hot tubbing together with a newly purchased bottle of Olympic Cellars wine from the local winery was better than a professional massage. The weather was great, the view phenomenal, and so secluded but within minutes of a town full of shops, lavender fields, and even a wild game farm worth the trip in and of itself. Walking down to our weekend beach front brought us to a time long forgotten. Exploring crabs scrambling sideways under every overturned rock, and finding colorful snail shells, became the height of our beach combing. We were gently being sprayed by an occasional underground sprinkler system, better known as clam beds which took us back to our childhood. These creatures encouraged us to look closer into their little world. When we saw a hermit crab looking for a "larger house", amongst the snail shells, this further enveloped us into their small world stage. This was the only world they knew. We engaged fully into the activities within the simple life of a tide pool. The simplicity desired by many, in an ever complicated life, will bring us back to a Sequim vacation rental again and again. 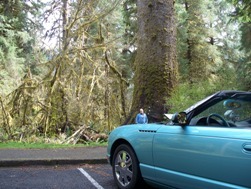 From there, it was off in our sports car to the Hoh Rain Forest within the Olympic National Park. We might have visited on the only day it didn't rain. It was even a warm day. Our convertible top was let down and we drove through the forest able to look straight up into the moss covered branches which umbrellaed the road ahead of us. 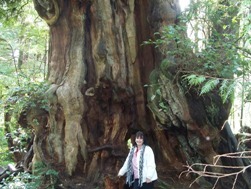 We were able to get up close and personal with 600 year old trees. What a road trip! We completed the loop back to Seattle through the destination of Ocean Shores, convertible top down most of the way stopping only to take a long walk on the sandy ocean beaches. Hard to believe it was April and 72 degrees. We will definitely be looking forward to our next Washington Road Trip, enabling us to visit unique vacation rentals in towns that welcome this tourist option. I don't think there is any better way to travel whether you’re reading about it in a dental office or making the trip an immediate reality. Gail Adair, is Vice President of The Vacation Rental Industry Association (VRIA.org)VRIA.org in charge of Legal Affairs. She is also a vacation Rental Owner. VRIA is a worldwide not-for-profit trade association comprised of Owners, managers, Suppliers and Website Publishers worldwide.